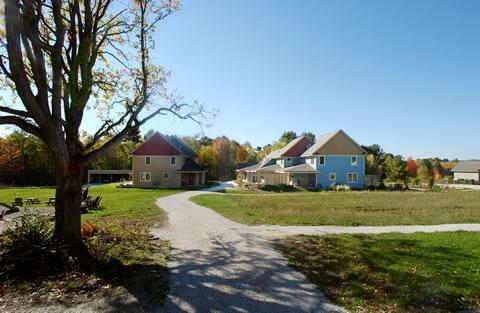 Do you belong at Champlain Valley Cohousing? We welcome all interested in environmental sustainability, compassionate relationships, and living meaningful lives. Do you seek community? As a community, we are dedicated to knowing each other in a meaningful way. We help each other with childcare, meals, and all sorts of projects. Do you crave space? We have privately owned homes clustered around a central green and collectively own another 115 acres of meadows and forest. Our homes are clustered around a central green, enabling little ones to enjoy safe independence and allowing all neighbors to enjoy spontaneous and meaningful social interaction. Our land lies in the charming rural village of Charlotte, Vermont. We are 14 miles from the vibrant city of Burlington, which has a lively downtown pedestrian mall, several small colleges, the University of Vermont, a regional teaching hospital, and an international airport. Middlebury, a charming college town, is an easy commute south. The international city of Montreal is an easy two-hour drive north. Gorgeous Lake Champlain is just four miles away. Our land consists of 125 acres of rolling farmland, wetlands, meadows, brooks, woods, hiking paths, and ponds. Surrounded by distant views of Buck Mountain, Mt Philo, and a glimpse of the Adirondack peaks, we are a rural, pedestrian-centered community with townhomes and single-family homes around an extensive central green. Excellent public schools, and pre-K through 12th grade Waldorf schools serve the community. Some 115 of our 125 acres are preserved forever for wildlife corridors and farming. Our parking is on the periphery of our neighborhood, making it safe for little ones and pedestrian-centric. We privately own our own modest homes. We share the trails, pastures, organic gardens, yurt, and the common green where potlucks and other social activities occur. We enjoy occasional potluck dinners, work together on keeping our community beautiful, and have lots of fun. We are committed to living in a thoughtful way that promotes environmental sustainability and healthy community relationships.